← Is Going Gluten-Free Healthy for Everyone? Flu Season – It’s Not Over Yet! Posted on March 28, 2017 | Comments Off on Flu Season – It’s Not Over Yet! According to the Centers for Disease Control and Prevention’s weekly flu report, flu activity remains elevated with 36 states reporting widespread influenza activity, mainly in the southern and southeastern states. While overall activity is declining, we are clearly not out of the woods, and can expect to see several more weeks of seasonal flu activity. Influenza, a highly contagious viral respiratory illness, causes mild to severe symptoms and can result in complications for young children, the elderly and those with compromised immune systems. Largely an airborne virus, the flu easily spreads from one person to another through droplets caused by sneezing, coughing or talking. Flu viruses can survive on hands for up to an hour, and can remain active on hard surfaces for up to 24 hours, potentially transferring the virus through touch. Those with the flu are infectious 24 hours before their own symptoms develop, and up to a week after symptoms appear. Unlike a cold, the flu comes on suddenly and tends to linger longer. Symptoms are often more severe than a typical cold and can include a runny nose, sore throat and dry cough, as well as fever, fatigue, headache, chills, and body aches. Surprisingly, the body’s immune defense system is responsible for some of the symptoms. A fever, for example, is the immune system’s way of making the body a less favorable host for bacteria and viruses, which thrive at 98.6° F. Although not everyone will feel feverish, the influenza virus causes a general feeling of exhaustion and malaise, that often requires bedrest. You can help stop the spread of the flu by avoiding unnecessary contact with others when you are ill, completely covering your nose and mouth when coughing or sneezing, getting plenty of rest, and staying warm and well hydrated. To help prevent the flu, avoid close contact with someone who is sick, wash your hands frequently, disinfect surfaces regularly and refrain from touching your face, eyes, and mouth. Be sure to support immune and overall health by getting sufficient sleep, eating nutritiously and participating in physical activity. General healthy-living strategies help to naturally strengthen the immune system, while supporting optimal health and overall function. Over the counter remedies can temporarily suppress symptoms, but may actually impede healing. While annoying, coughing is a productive symptom that helps clear breathing passages. Decongestants restrict flow to blood vessels in the nose and throat, but allowing the blood to flow helps to warm the infected area, enabling secretions to carry away germs. 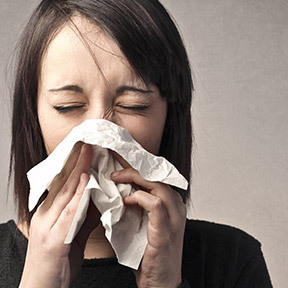 Although symptoms of fever, stuffy nose and coughing are sometimes hard to endure, they are part of the natural healing process, evidence that the immune system is battling the virus. Natural remedies that support the immune system are often helpful either for the prevention of influenza or the recovery from it. Oscillococcinum® – Though hard to pronounce, this homeopathic taken at the first sign of illness has been shown in clinical trials to help reduce the duration and severity of flu-like symptoms, including body aches, fever, chills, headache and fatigue. As flu comes on quickly, and Oscillo works best when taken early, it’s helpful to keep this on hand to take as quickly as possible when symptoms begin to appear. Echinacea – This popular medicinal plant has been used for more than 400 years to treat infections and wounds. Laboratory studies suggest that echinacea contains active antiviral and antioxidant substances that support and stimulate the immune system to help fight viruses, reduce inflammation, and relieve pain. Elderberry – Used for centuries to treat respiratory illnesses and heal wounds, evidence suggests that elderberry has anti-inflammatory, antiviral and anti-influenza properties. High in flavonols, elderberry may help to reduce sinus mucous membrane inflammation and relieve nasal congestion. Garlic – Supported by modern science and known since ancient times for its therapeutic properties, garlic has been shown to be beneficial for respiratory, circulatory, cardiac, and immune health. Consumed regularly, garlic may aid in the prevention of the common cold or may expedite the recovery process. Oregano Oil – Very high in antioxidants, oregano oil has been shown to combat certain strains of bacteria and microorganisms, and prevent them from proliferating. Oregano oil has been used traditionally for centuries as a natural remedy to treat symptoms of respiratory illness, including coughs, colds, and sore throats. Effective as a natural infection fighter, oregano oil has strong antiviral, antibacterial and anti-inflammatory properties. NAC – N-acetyl-L-cysteine, an amino acid derivative with mucous thinning properties, has been used in conventional medicine for over three decades. NAC has been shown to reduce both the severity and the duration of the flu by supporting the production and activity of white blood cells, helping to boost the body’s natural immune response. Vitamin D3 – Research indicates that vitamin D3 taken prophylactically is effective in prevention of common upper respiratory infections, including colds and flu. Vitamin D3 supports the immune system by reducing levels of inflammatory proteins, and increasing levels of antimicrobial proteins, naturally occurring antibiotics that destroy invading pathogens and viruses. Studies show that those with lower levels of vitamin D3 are more likely to develop influenza when compared to those with high levels of vitamin D3. Oscillococcinum® by Boiron: These highly effective homeopathic pellets work with your body to reduce the duration and severity of flu-like symptoms, including body aches, headache, fever, chills and fatigue. Non-drowsy formula. Children’s formula also available. ACF Fast Relief Immune Support High Potency by Buried Treasure Nutritionals: This high potency, fast acting liquid immune support formula provides high quality botanicals and nutrients for cold and flu symptom relief. This naturally preserved formulation is gluten, wheat, yeast and dairy free. NAC 600 mg by Pure Encapsulations: NAC provides powerful cellular nutritional support, specifically supporting healthy lung function though its mucolytic activity. In addition to its antioxidant properties, NAC supports glutathione production, ramping up antioxidant protection. Gluten-free, Non-GMO vegetarian formulation. A.D.P.® by Biotics Research: This patented, proven effective formula supplies delayed release standardized oregano oil delivered to the intestinal tract to defend against pathogens and bacteria. Gluten free formulation. Vitamin D 5000 IU by Douglas Laboratories: This product supplies 5000 IU of highly bioavailable natural vitamin D3 in support of overall health. Gluten, wheat, soy, yeast and dairy free vegetarian formulation. This entry was posted in Home and tagged A.D.P.® by Biotics Research, ACF Fast Relief Immune Support High Potency by Buried Treasure Nutritionals, Echinacea, Elderberry, Flu Season – It’s Not Over Yet!, Garlic, NAC, NAC 600 mg by Pure Encapsulations, Oregano Oil, Oscillococcinum, Oscillococcinum by Boiron, Vitamin D 5000 IU by Douglas Laboratories, Vitamin D3. Bookmark the permalink.